Mormon cricket, Anabrus simplex, perched in a cherry tree. Mike Klaus, WA State Dept. Agr. 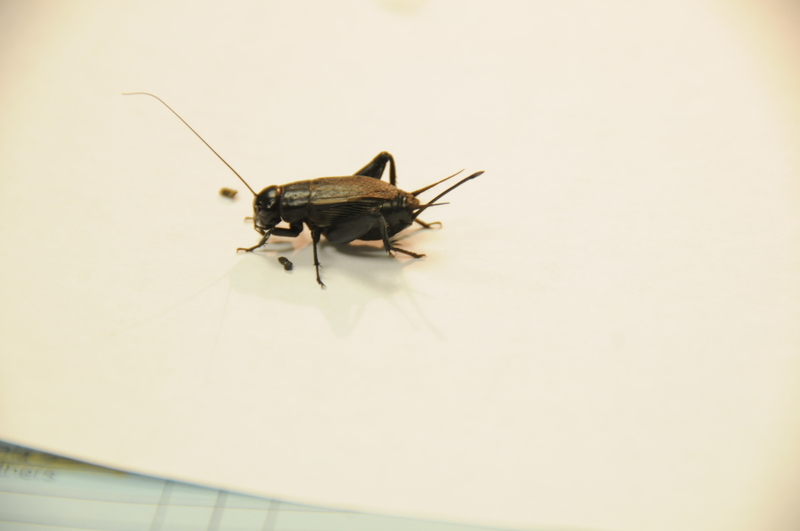 This field cricket , Gryllus spp., is one of many species of true crickets. Pest description and damage Most crickets, Mormon crickets and katydids have a leathery pair of front wings and membranous pair of hind wings; females have a sword-like ovipositor. Camel crickets are wingless and, in some cases, have caused damage to seedlings. The true crickets have a more flattened back than grasshoppers or katydids. Males stridulate using various structures, e.g., crickets rub their forewings together and lift their wings to amplify the sound. Crickets are omnivorous scavengers and will eat seeds, organic detritus or dead insects including their own kind. They are rarely a problem in landscapes other than providing a pleasant nocturnal sound. Rarely in the northwest, more commonly in east coast states, crickets may enter houses and feed on clothing or other materials. Mormon crickets are technically katydids. Their colors are variable, and their wings reduced so they are flightless. Their populations occasionally become epidemic. They migrate by crawling and can move more than one mile per day. Crossing roads, their crushed bodies form slick masses that become a safety hazard for motorists. Katydids, or long-horn grasshoppers, are generally green with oval, leathery wings. Their body is flattened from side to side and the wings are leaf-shaped, even bearing veins, fungal leaf spots and holes similar to damaged leaves. They feed on tender leaves of deciduous plants (especially oaks), and occasionally on other insects. Biology and life history The true crickets lay their eggs by pushing their ovipositor into the soil and inserting the eggs. The overwintering eggs hatch in spring. The young look like mini-adults. Older instars develop visible wing buds. Some species of crickets can lay eggs almost continuously through the summer. Katydids lay their flat eggs overlapping like shingles on the bark of twigs in autumn. Pest monitoring This group is mostly nocturnal; small numbers rarely warrant control measures. Most people may find the cricket sounds to be enjoyable. It is difficult to locate crickets or katydids by sound. 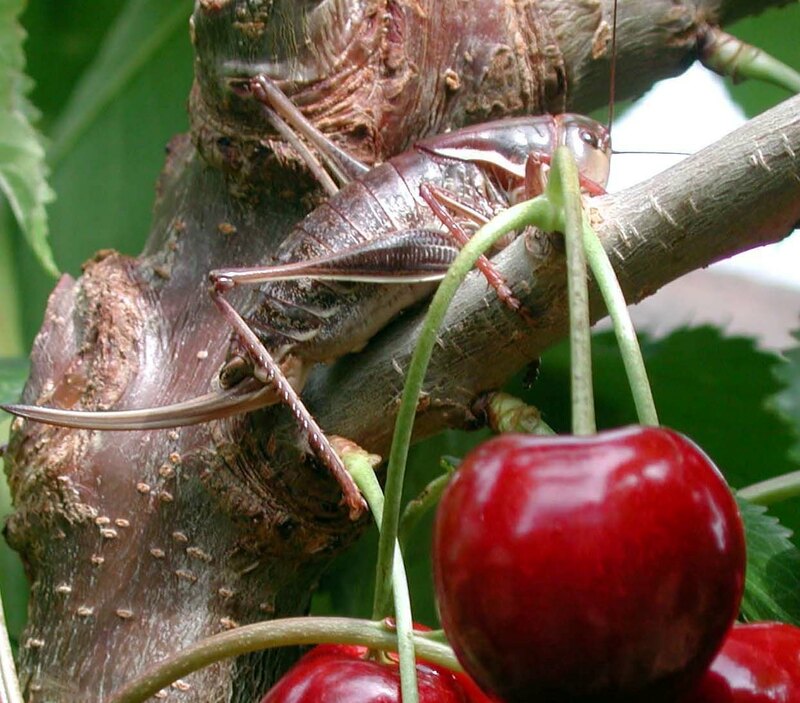 Grasshoppers, crickets and katydids are eaten by many animals, birds, and insectivores. There are commercially packaged micro-organisms for bio-control of these insects.